Johnny Coast is a frame-builder out of Brooklyn. You may have seen his interview in COG Magazine‘s issue number 03 last year. Coast’s frames are highly sought-after here in NYC as well as across the country. He specializes in Randonneuring, Touring, Track and Road frames, as well as custom stems and special detailing. All of his frames are 100% custom, specified for each customer’s needs. He’s recently uploaded a few shots to his Flickr account. 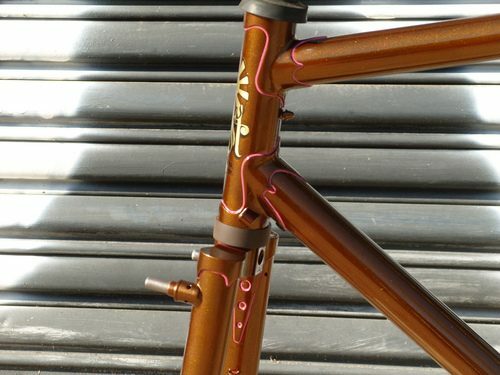 This rootbeer touring frame is gorgeous. The lug lining offsets the candied brown coat done by Vicious Cycles, another NY-based company. If you’re interested in a custom frame, you should look into Coast’s work. The owners of his bikes have been more than pleased with his work.